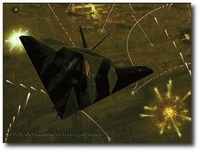 The F-117A Nighthawk is the world's first operational aircraft designed to exploit low-observable stealth technology. 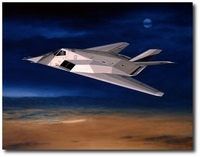 The unique design of the single-seat F-117A provides exceptional combat capabilities. About the size of an F-15 Eagle, the twin-engine aircraft is powered by two General Electric F404 turbofan engines and has quadruple redundant fly-by-wire flight controls. Air refuelable, it supports worldwide commitments and adds to the deterrent strength of the U.S. military forces. The F-117A can employ a variety of weapons and is equipped with sophisticated navigation and attack systems integrated into a state-of-the-art digital avionics suite that increases mission effectiveness and reduces pilot workload.